St Mirren sat quite deep in their 4-5-1 against the ball, attempting to limit Rangers’ access to dangerous spaces instead of pressing their deep build-up. Captain Steven McGinn in the centre was fairly flexible in his role, occasionally pushing slightly higher behind striker Brock-Madsen out of possession. Rangers in their 4-3-3 continued to look to penetrate on the flanks to feed Alfredo Morelos, with their high pressing gifting them the opening goal and preventing the away side from settling into the possession play that Alan Stubbs has encouraged. John Flanagan took over from James Tavernier at right back, with debutant Borna Barisic starting on the left. It was in these areas that Rangers were at their most interesting. Both fullbacks pushed very high on the flanks to add an extra threat for breaking through there. The fluid wide triangles on both sides allowed for small-scale combination play. Kent on the right side typically looked to break in behind on the flank or move inside. Furthermore, he was quite active in maintaining a strong connection with the right back in deep build-up, as an escape route against higher pressing. With Kent favouring the flank, Flanagan’s advances took him infield in the halfspace. Though this was an intelligent move, pinning the St Mirren midfield with the threat of a penetrating pass through the centre, thus giving Kent more space on the wing, Flanagan is not as skilled or playful as Coulibaly or indeed Tavernier. As a result, group-tactical solutions to break through the deep St Mirren block or to advance possession on the right were unlikely to come from the former Liverpool man. Coulibaly most often anchored the wide triangle on the right side, dropping out as Flanagan advanced. From here, the Malian international showed an ability to bring the forward players into play with fast, accurate passes into the feet of Morelos, though the structures supporting these passes are lacking currently. Goldson’s positioning in possession oftentimes allowed for even more adventurous structures on the right flank. Moving over almost to the flank, and allowed to advance slightly, he can anchor that side himself, pushing Coulibaly forwards into positions where he is more able to display his skilful combination play. The left side looked far more coherent and effective as an outlet for Rangers, in no small part due to the forward running and impact of new signing Barisic. Murphy already moves inside a great deal, especially between the lines, while Ejaria’s tendency to drop outwards further opens this space and allows Barisic to advance freely on the flank. Reminiscent of a scene from David Bates’ 2. Bundesliga debut, this is one of my favourite actions of the season so far. Baresic single handedly breaks St Mirren’s pressing with a highly creative solution. Such skilful maneuvers demonstrate the Croatian fullback’s potential value to this Rangers side. 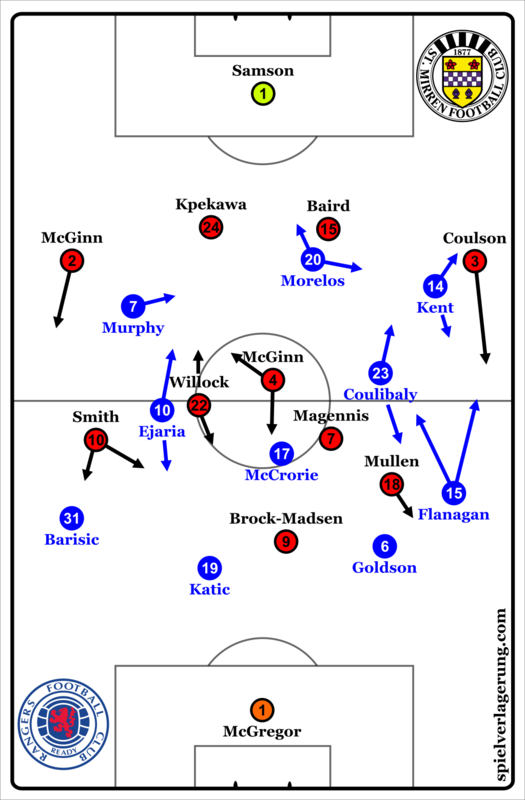 These movements were effective in bringing Rangers to the final third against St Mirren, though had the away side’s higher pressing been slightly better organised they could have caused Gerrard’s men problems. Coordination issues early on saw the fullback positions left vacant as Flanagan and Barisic advanced. Though this was bypassed by a string of long diagonals from Goldson to the far side, had the Englishman been pressed more actively this would not been as viable as option. Furthermore, without these options the width of the first line was dramatically reduced, making it more difficult to play around pressure stably. 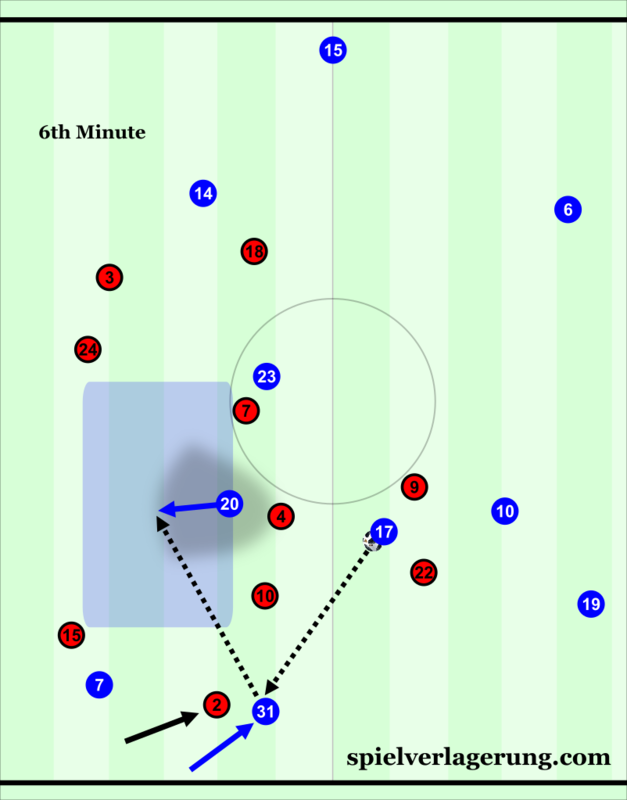 The solution of the near eight dropping out to the fullback position was risky not only in a dynamic sense, but against well-organised pressing is still difficult to escape. Were St Mirren to press in a less man-oriented way when McCrorie dropped into the back line to form a 3v2, they would have been able to maintain pressure effectively as the ball was played to one of the outside centre backs. From there, the near winger could protect the centre with his cover shadow, whilst maintaining access to the midfielder in the fullback position. With a slightly curved run he could block passes into the wide triangle, and force play into the centre of midfield, where St Mirren were far more present than the hosts. Instead, Brock-Madsen and McGinn pushed up directly against one man, leaving the third player in the newly-formed back three completely free to bring the ball forwards. The guests seemed to allow this to be Katic, presumably conscious of Goldson’s strong range of incisive passing, as he showed on numerous occasions in the opening minutes. Katic could easily gain space in the left halfspace, with the midfield line sitting passively. As a result, Rangers pinned St Mirren back in the final third, bringing the ball there often, without creating many strong chances. As a central defender dribbles in, he is typically looking either for an opponent to step out to press him, leaving space behind to play round into, or chipped balls in behind the defensive line, preferably diagonally, if he is allowed to continue (or dribble straight through the midfield and pick out a through ball). Little action on the ball-far side left Katic without this diagonal option, while the distances around the ball ahead of him were somewhat too short to by truly useful. Little depth was a wider problem as Rangers brought the ball forwards centrally. Morelos dropping off the front line in the final third combined with Kent and Murphy also playing between the lines gave few options for playing behind the St Mirren back line. This is not to say Morelos’ movement into midfield is not without its uses. The Colombian striker frequently provided effective overloads in the middle of the pitch by dropping centrally with his strong combination play. He certainly adds more to his team in this sense than if he were to excessively run the channels to bring his team up the pitch. However, the deep St Mirren line allowed Morelos to attack the penalty box directly if he so chose, a situation in which he is at his most dangerous. Dropping off the front line in these positions reduced his ability to attack the crosses and cute balls to the top of the box that come so frequently against such a deep line. Without any options in depth, Katic is forced into a harmless chip behind a prepared McGinn. Coulibaly and Kent on the far side could be more active, while the distances and structure immediately around the ball-carrier make it difficult to progress possession through that way. St Mirren’s wingers further congested the final third. By following the Rangers fullbacks and dropping into the defensive line, their own fullbacks could cover the halfspaces, reducing the hosts’ ability to combine through those areas into depth to find good crossing positions. Instead, the home side were forced into poorly timed crosses from deep positions into the box, with only one or two players attacking the ball. The red card for McCrorie posed some interesting questions. Would Rangers revert to the same 4-3-2 they utilised the week previous in Aberdeen? Would they look to press as readily as they had done against the Dons? How would they adjust in their build-up play? Indeed, the home side retained much of their approach with eleven men. Ejaria moved as a lone six in possession, Coulibaly moving half-right. Murphy continued to drift inside, though in a more defined manner in the left halfspace, playing between the St Mirren outer midfielders, with Barisic also pushing on the left flank. Kent stayed more on the right, while Morelos favoured that side also. St Mirren sought to take more initiative in response to gaining the man advantage. They pressed more actively, engaging the Rangers build-up in their own their own half. Willock joined the striker in his pressing action, moving diagonally from the central Ejaria to Katic, creating a situational 4-3-1-2, with Magennis moving up on the six. As the second half began, however, St Mirren’s lack of adjustment to Magennis and Willock’s pressing from their 4-5-1 opened large spaces between Steven McGinn and his wide midfielders, inviting Murphy and Kent to make frequent moves to receive inside. Though a more conventional double-pivot of Ejaria and Coulibaly and a more direct style to Morelos was played, these spaces were still utilised readily to bring the home side forwards. The guests themselves were quite clean and precise in possession. On the occasions that they saw extended periods on the ball at 11v11, they were able to play through Rangers’ midfield, particularly in the halfspaces, and with strong connections on the flank once having done so. Individual aggression in counterpressing and a large central presence high up the pitch helped them maintain pressure on the hosts and keep play in Rangers’ half for decent spells. After Rangers went down to ten men, St Mirren were very active in advanced central areas. Willock and Magennis pushed far more in the second half, while Smith and Mullen moved more centrally in the final third. Indeed, Smith acted almost as a ten when St Mirren looked to attack the Rangers back line, with Paul McGinn and Coulson pushing high on the flanks. With Stubbs’ men not lured into playing direct at the first signs of Rangers pressure, they could force Rangers back into their 4-4-1 after spells of high pressing. By cleverly supporting Brock-Madsen and other advanced players, and through patiently circulating when openings were not immediately available, they broke into the Rangers third often and in good condition. That St Mirren were not able to convert their good spells into a goal is a testament to Rangers’ penalty box defending. Such performances in possession will see the Buddies in good stead against most Premiership opposition. Of course, the first goal represents the risks involved in Alan Stubbs’ style, but against teams with lesser defensive organisation and less intense pressing they should enjoy enough control in games to be safe from relegation this season, especially if they can work to be more compact defensively. As for Rangers, Steven Gerrard again guided ten men to a good performance. The style they faced was considerably different from what they contested in Aberdeen and drew a response to suit. Their play at 11v11 showed further promise and definite signs of progression from Steven Gerrard’s men. This website and this article is very impressive. I watched this game live and it made a very interesting read. Great analysis of the post red card display too. I’ll be coming back to this site if you happen to do more Rangers games. Thanks and good luck!